Frank Codd, who coordinates our float, poses with Kathy Maier and our ribbon for participating in the Rose, White, and Blue Parade in San Jose. 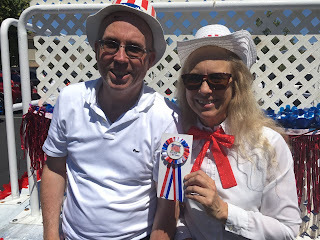 For decades, the Rose, White, and Blue Parade has wound its way through the Rose Garden neighborhood of San Jose on Independence Day, July 4. And for the last few years, the Castro Valley Community Band has been pleased to be part of this annual tradition.